Coopers Court is located in the heart of London's vibrant East End, within easy access of many universities; particularly Queen Mary Univeristy. Within a minute, you can be at Mile End tube station in zone 2 which provides a convenient route into central London. The student accommodation itself offers en-suite bedrooms with free 50Mb Wi-Fi, all inclusive bills and free contents insurance included in the weekly rent. 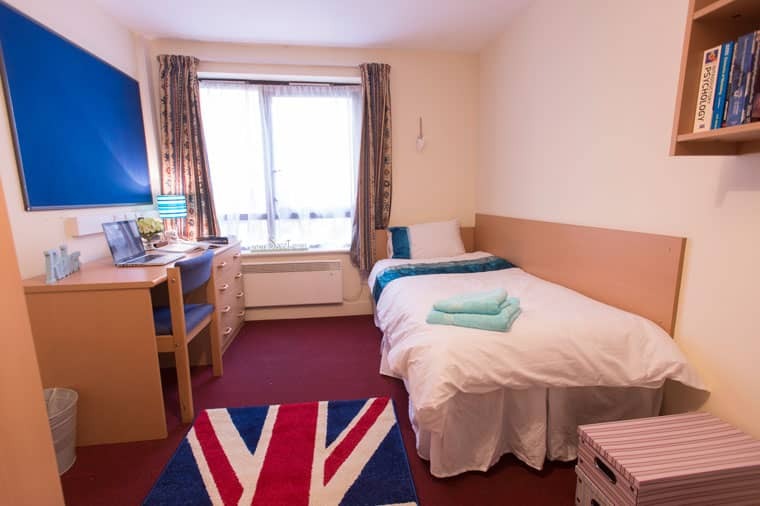 and is the perfect base for students living in the UK capital. Coopers Court is available for 44 or 51 week contracts. You can pay your rent in 1 or 3 instalments. This newly rerurbished room has a double bed and private bathroom. Coopers Court is conveniently located for many university and college campuses, making it an ideal base for studying and enjoying all that London has to offer. Less than a minutes' walk from Mile End tube station in zone 2, Coopers Court is within easy reach of central London and just moments away from vibrant Brick Lane and the diverse communities of Whitechapel. Managed by our staff at nearby Don Gratton House, Coopers Court is small but perfectly formed. The accommodation has just 54 single en-suite bedrooms arranged in flats of five, with a shared kitchen and living room, creating a real community feel. With beautiful parks, shops, bars and cafes close by, you have all you need on your doorstep. Entry is by secure electronic key card and there is CCTV throughout, giving you peace of mind so you can get on and enjoy Student life. All your bills are included in your rent making it easy to manage your money. Free broadband is available in every bedroom, with laundry and bike storage facilities on-site. This newly rerurbished room for 2019/20 will have a double bed and private bathroom. Coopers Court offers a great location in the heart of London's vibrant East End. Less than a minutes' walk from Mile End tube station in zone 2, Coopers Court is within easy reach of the city centre. 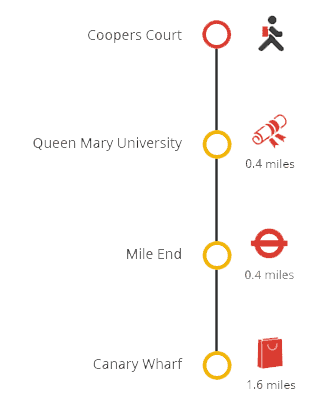 There's also easy access to universities, with Queen Mary University just a five minute walk away. Other universities are 15 to 30 minutes away by public transport. For convenient student living there's a local corner shop two minutes away, and Mile End Park is just around the corner, perfect for relaxing outside in the summer. You can collect your keys from the day your contract starts. On arrival you will be directed to the residence office front desk for check in. You will be required to sign a copy of your licence agreement and have a photo taken for your ID/entry card. If you haven't already paid your first instalment you will be directed to a payment desk before you can check in. To avoid queues and delays on move-in day, you can pay your first instalment online at any time prior to arrival at the residence. Once check in is completed you will be given the keys to your room. Coopers Court now benefits from LaundryView which will make doing your laundry on-site even easier. The system, created by Circuit, allows you to go online and check the availability of washers and dryers in your building as well as see when other washes are about to end. If you wish to bring a car to London you will need to apply for a residents' parking permit through Tower Hamlets Borough Council.